When you see the cheese melt out, it's like seeing the very face of God. Plus, it's melting out of QUINOA BALLS. Quinoa meatballs. Faux meatballs. Fauxballs? Never mind. You know those days when you know you need to eat healthy, but a block of cheese taunts your soul from the depths of the fridge? And you must eat the cheese before it molds (even more)? But you still need to eat the healthy stuff or else you'll turn into a blob of human blobby blob? But the cheese calleth? But your waist line beggeth? But the cheese keeps singing? And your double chin keeps crying? 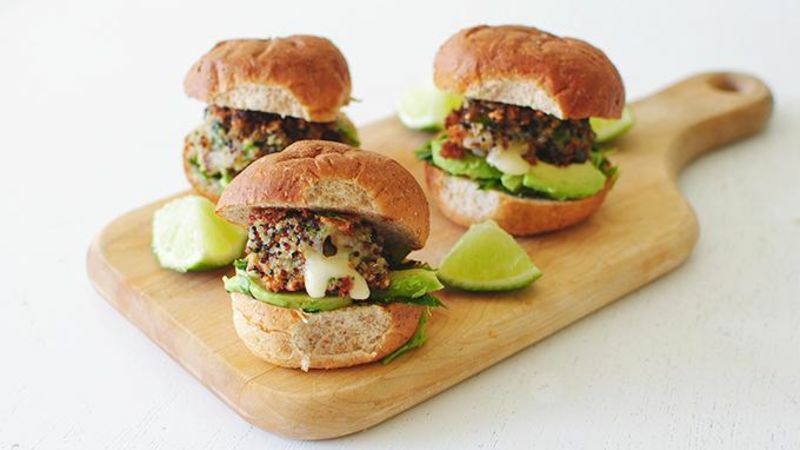 Cheesy Quinoa Sliders. Hi, drive through and you're welcome. Let's go home. Cook some tri-colored (or any color) quinoa. Drain and transfer to a big bowl to cool. Done. Then add some flour, grated Parmesan, and a pinch of salt and pepper! Easy. Then stir in some chopped cilantro, scallions, an egg and an egg yolk. Voila. THEN add all the little cheese cubes of glory. You'll just form quinoa balls out of the mix and arrange them on a baking sheet. Then fry fry fry! The cheese will start to melt out and you will weep. Tower o' cheese. I mean quinoa. Whatever. Place them on some slider buns with pesto and sliced avocado and know what true living is. Did Bev mention the cheese? For more musings, visit her blog Bev Cooks and her Tablespoon profile.